Having quality cubicles in your office is important because not only are they the place where your employees will be spending a lot of their time, but they also play an important role in the aesthetic appearance of your office. 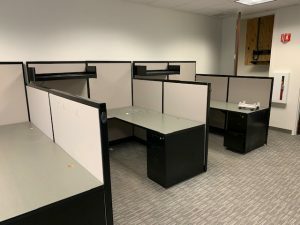 Since our founding in 1994, NorthPoint Office Furniture has helped countless businesses throughout the Norcross, GA, area by supplying them with beautiful and durable cubicles. We have a large selection of new, used, and refurbished cubicles that are available in a variety of styles, so you’ll be able to find the right cubicles that meet both your needs and your budget. Choose from a large selection of cubicles from some of the top brands in the industry. Visit our huge 8,000-square-foot showroom where we have our cubicles, as well as our other types of office furniture staged so you can visualize what they will look like in your office. Speak with experts who will listen to your goals and help you choose cubicles that will suit your needs perfectly. What’s more, once you decide to purchase your cubicles from us, we will install them for you quickly at no additional charge, so your employees can get right to work. To learn more about the cubicles we have available for businesses in the Norcross, GA, area, contact NorthPoint Office Furniture today.